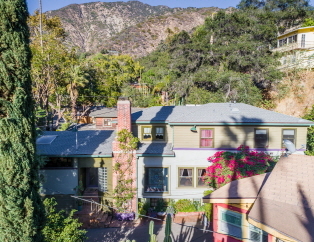 Interior Features The quaint, artistic Canyon of Sierra Madre is known for its eclectic architecture, bridges, river rock walls, stream and wildlife. This custom built, streamline home with Art Deco influences features nearly 3400SF, including an office for 2 with kitchen, skylights and truss ceiling. The living room has a fireplace and 9’3” decorative ceiling. The kitchen area features custom cabinets, pantry and a den with full bath. The upstairs features 3 bedrooms, including a spacious master suite with luxurious bathroom. Downstairs is a 4th bedroom suite with kitchenette that works well as a teenager or in-law quarters. Please reference the attached amenities & upgrades list highlighting the wonderful details in this masterpiece of a home! This must see home is truly like being on vacation every day!